Stop getting speed tickets with Speed Trap Plus! 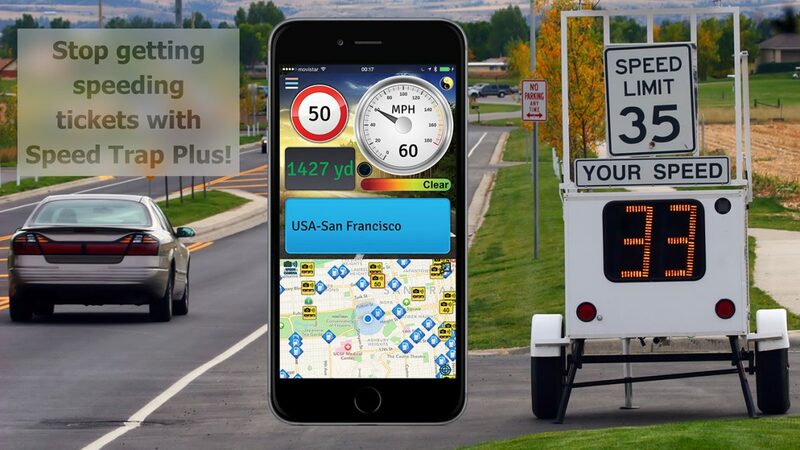 Speed Trap Plus will transform your iPhone and iPad into the best speed trap detector. Thanks to using one of the biggest and most accurate databases in the world, you will receive Visual and Audible alerts before speed traps with enough time to slow down and avoid a ticket. In addition, Speed Trap Plus will let you see if there are dangerous spots in the road ahead of you, it will give you clear alerts with cool voices and it is optimised to have all the necessary information in a single screen to provide the best experience while driving. And you can even use it on a widget and in your Apple Watch! No more traffic tickets with Speed Trap Plus, give it a try, it’s free! Worldwide coverage of speed traps, black points and gas stations using one of the world’s most detailed databases. Supports Imperial and metric systems. A voice driven navigator to help you reach your destination. A smart design that shows all the necessary information in a single screen to be easy to use while driving. A map that follows you on the road and lets you see your location and the nearest speed traps, black points and gas stations. Audio traffic reports with relevant information about- traffic congestion, incidents, road works and weather conditions; are available for most countries. Cool Visual and Audible alerts are given before reaching speed traps and black points to give you enough time to slow down. A Today Widget and Apple Watch integration so you do not miss anything on the road. A small manual inside the App. The possibility to contact support from inside the App. A rotatable interface to adapt to all situations. A shaking control to reset the status of the App or to go back to the main screen. A design to adapt to your preferences. 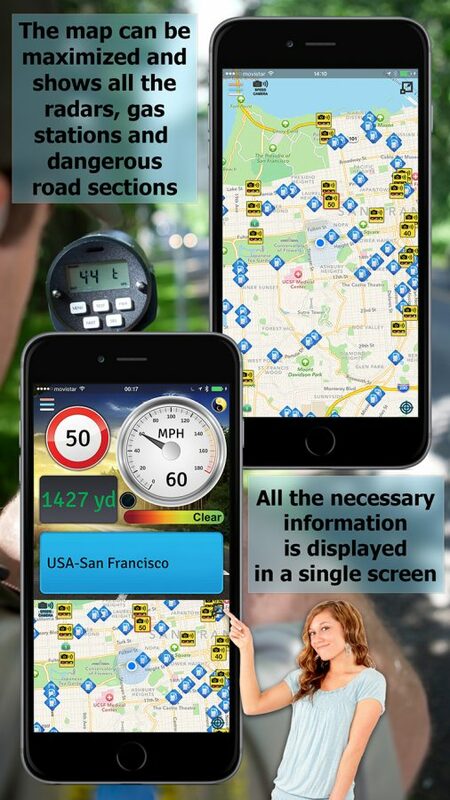 The possibility to upgrade the App to a Pro, ad free version of the App with an improved speed traps database that will unleash the full potential of Speed Trap Plus by means of an auto-renewable subscription that lasts 1 year with a 1-month free trial period. 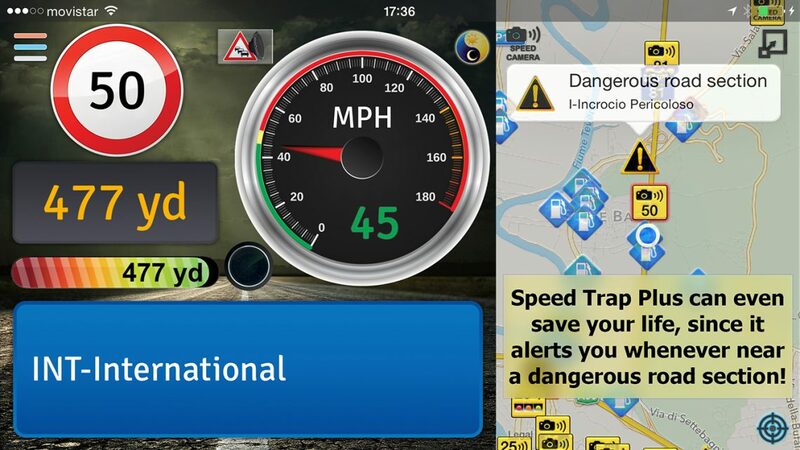 Don’t miss out Speed Trap Plus’ Pro Version Upgrade – 1 Year Plan for 4.99. In-App Purchase additional notes: The payment will be charged to your iTunes Account at confirmation of the purchase. The subscription automatically renews unless auto-renew is turned off at least 24-hours before the end of the current period. Your account will be charged for renewal within 24-hours prior to the end of the current period for a price equal or lower to the price of the previous subscription period, currently the price is 4.99. The subscriptions may be managed and the auto-renewal may be turned off by going to your iTunes Account Settings after purchase. No cancellation of the current subscription is allowed during an active subscription period. Any unused portion of the free trial period will be forfeited when a purchase to a subscription to that publication is made. This subscription offers a free trial prior to charging you. If you decide to unsubscribe before charging starts, cancel the subscription before the free trial ends. It is available in various languages, including: English, Spanish, French, German, Italian, Portuguese and Catalan. eVolutive is a company whose main purpose is the design and development of mobile Apps and Websites. Its activity started in 2010, therefore we share in equal parts significant experience and passion for those contemporary technologies. We also develop projects for other companies, just check the Contracts section of our site. This are Speed Trap Plus’ terms and conditions for its auto-renewing yearly subscription. The payment will be charged to your iTunes Account at confirmation of the purchase. The subscription automatically renews unless auto-renew is turned off at least 24-hours before the end of the current period. Your account will be charged for renewal within 24-hours prior to the end of the current period for a price equal or lower to the price of the previous subscription period, currently the price is 5.99. The subscriptions may be managed and the auto-renewal may be turned off by going to your iTunes Account Settings after purchase. No cancellation of the current subscription is allowed during an active subscription period. Any unused portion of the free trial period will be forfeited when a purchase to a subscription to that publication is made. This subscription offers a free trial prior to charging you. If you decide to unsubscribe before charging starts, cancel the subscription before the free trial ends. This is eVolutive’s terms and conditions regarding the usage of any of its Services, Apps and Websites. This license shall automatically terminate if you violate any of these restrictions and may be terminated by eVolutive at any time. Upon terminating your viewing of these materials or upon the termination of this license, you must destroy any downloaded materials in your possession whether in electronic or printed format. The materials on eVolutive’s web site are provided “as is”. eVolutive makes no warranties, expressed or implied, and hereby disclaims and negates all other warranties, including without limitation, implied warranties or conditions of merchantability, fitness for a particular purpose, or non-infringement of intellectual property or other violation of rights. Further, eVolutive does not warrant or make any representations concerning the accuracy, likely results, or reliability of the use of the materials on its Internet web site or otherwise relating to such materials or on any sites linked to this site. In no event shall eVolutive or its suppliers be liable for any damages (including, without limitation, damages for loss of data or profit, or due to business interruption,) arising out of the use or inability to use the materials on eVolutive’s Internet site, even if eVolutive or a eVolutive authorised representative has been notified orally or in writing of the possibility of such damage. Because some jurisdictions do not allow limitations on implied warranties, or limitations of liability for consequential or incidental damages, these limitations may not apply to you. The materials appearing on eVolutive’s web site could include technical, typographical, or photographic errors. eVolutive does not warrant that any of the materials on its web site are accurate, complete, or current. eVolutive may make changes to the materials contained on its web site at any time without notice. eVolutive does not, however, make any commitment to update the materials. eVolutive has not reviewed all of the sites linked to its Internet web site and is not responsible for the contents of any such linked site. The inclusion of any link does not imply endorsement by eVolutive of the site. Use of any such linked web site is at the user’s own risk. Any claim relating to eVolutive’s web site shall be governed by the laws of the State of Spain without regard to its conflict of law provisions. By using any of the services provided by eVolutive you agree to the General Terms and Conditions here stated. This is eVolutive’s policy to respect your privacy regarding any information we may collect while operating our Services, Apps and Websites.